1999 FLASHBACK > PROTON PERDANA V6 – MID SIZED CAR BY PROTON. As usual, every week we will post about the old model from Proton or Perodua in the segment of “Flashback”. So, today we would like to post about the Proton Perdana V6.The Proton Perdana V6 is a mid-sized car which had been produced by Proton since year 1999. It is a badge engineered version of the seventh-generation Mitsubishi Eterna. The Perdana V6 is powered by Mitsubishi 2.0 L 6A12 V6 engine.With Lotus-tuned and upgraded suspension settings, the car handles well through tight corners and it is a good high speed cruiser.It also had the new bodykit and 16″ rims. 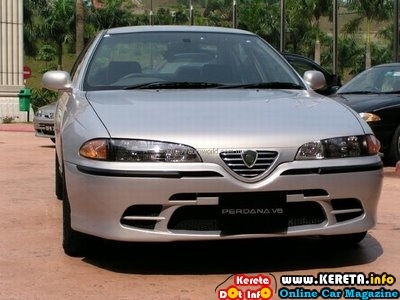 In 2003, the Perdana V6 was given a major facelift,the most obvious change is in the nose, with a grille described as ‘exuding the classic European designer look’. The Proton badge is set against a slatted triangular opening between the lights that is reminiscent of Alfa Romeos with the opening ‘cutting’ into the bumper quite deeply. Considering the fairly short development period, it’s not surprising that the engineering was basically unchanged with the changes occurring in areas where new components can be slotted into existing openings, eg headlights and tail lights, and changes to the trim. The body are also carried over. The total number of changes in the new Perdana is 25, of which 12 are on the exterior and 11 inside, and 2 in the suspension. Also made available is a luxury variant of the Proton Perdana V6 with an extended length of 25 cm in the rear door, dubbed the Proton Perdana V6 Executive. The Executive is essentially a conversion of the Perdana V6 by Automotive Conversion Engineering (ACE), a subsidiary of EON specialised in developing limousines for statesmen and building TD2000s.Two Perdana V6 Limousine variants are additionally released by ACE with extended lengths of 66 cm and 91 cm and sport far more luxuries then the Executive variant. In Malaysia, one of the well known club for the Perdana V6 is the V-Sixers. 1. Cek/tukar fuse untuk headlamp. Kalo fuse dah lama, tukar je. Ikut daya rintang yang ditetapkan. 2. Kalau dah tukar fuse baru dan betul masih gak terbakar, maksudnya ada short circuit. Sila cek wiring untuk headlamp. Mesti ada bocor/koyak kat mana2 dan touching dgn body kereta. baik hang cek secepat mungkin. masalah wiring adalah punca utama kenapa kereta tiba2 boleh terbakar (walaupun ketika tengah parking). Biasanya kalo kereta yang pernah buat/tambah aksesori yang ada potong/tapping wiring asal kereta memang ada risiko nih. Contoh pasang ICE, tukar HID, masuk airhorn, Strobe lamp sebab nak glamer atau nak jadi marshal konvoi, lampu brek ala2 F1 kunun dll…. nk tnye sy minat lh tengok skirting pedana warna merah ni..kt mn nk beli?? boleh sy tahu..urgent..
ni no contact sy 0175512279..harap dapat membantu..
Saya pun minat skirting/bodykit Prdana ini. Di mana boleh saya beli ? Ade bunyi busing bila tekan minyak kenapa?